Review – £500 sell your own house inc VAT!! Initially, I was a bit sceptical about this offer, thinking it was too good to be true, so I went into the Swift Sales Office on Mutley Plain and made enquiries. All I needed to do was to show potential buyers around my home! And Swift does the rest! I thought to myself, I can do that! I could also answer any questions the potential buyer may have myself, thereby reducing waiting time for these questions to go from buyer to agents and then to me. I wanted to try and make savings on selling my house, rather than pay the full marketing price. I thought about going with a Online agency, but really for me, I wanted a high street shop to go into if I had a query. 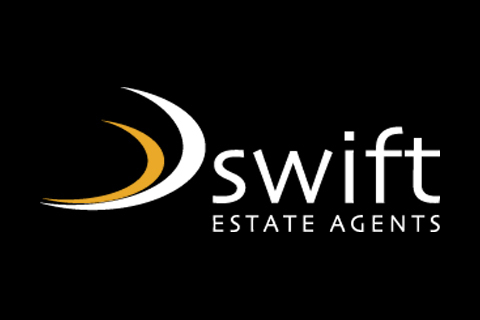 Swift offered both options, and when I went into the Swift Sales Office, I can say that I found all the staff to be friendly, helpful and above all very genuine. So, I signed up and paid the money upfront, knowing at any stage if it wasn’t for me then I could upgrade to Swift’s Enhanced Marketing Package, by deducting my already paid upfront £500 fee from final sale. I was so pleased with the Photographs taken. They were really lovely and very professional, without the professional charge, and I was so pleased, (all included in the £500!). 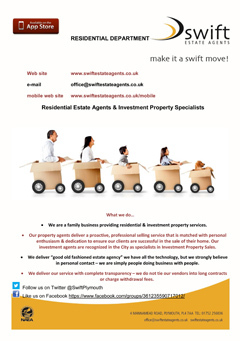 My Property was advertised over 29 Portals including Rightmove, Zoopla and Prime Location. I felt very comfortable showing people around and I was able to easily answer questions. 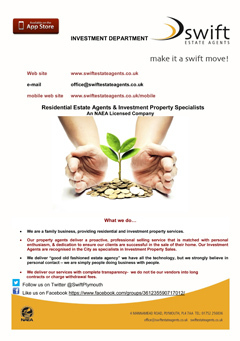 Feedback was given to me the following day by Swift and I was also given a Marketing Report which shows how many people were viewing on Rightmove. My house sold on the 3rd viewing!! I was so pleased! This offer definitely worked for me, and made savings! I would definitely recommend this offer. Why pay more than you need to?? p.s. (There were some really helpful pointers to help sell your house Included in the paperwork).